CES 2009: US TV to go all-digital on February 17 - or maybe not... | What Hi-Fi? Many Americans aren't prepared for the switchover to digital, and face losing their TV service on February 17. The switchover date was put into law by the Bush administration in February 2006. But a call for postponement of that date has been made in a letter from John Podesta, of Obama's transition team, to the Commerce Committees of the US House and Senate. "Millions left in the dark"
A delay is supported by Senator Jay Rockefeller, recently appointed Chairman of the Senate Commerce Committee. He said, “I've long believed that there is too much at stake for consumers and for public safety to simply cross our fingers and hope for the best when it comes to the digital television transition. "Millions of Americans could be left in the dark if this doesn't go smoothly." Much of the trouble is said to stem from the coupon scheme set up by the US government to help consumers buy new digital equipment or set-top box converters. There have been suggestions that funding for the $40 coupons, issued at the rate of up to two per household, has run out, but Texas Senator Joe Barton, opposing changes to the original plan, says these suggestions are unfounded. "The DTV transition program isn't failing, and reintroducing uncertainty to the switch will make things worse instead of better,” he said. 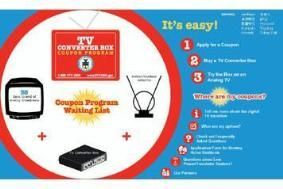 The coupons are designed to pay, or part-pay, for conversion equipment, the US government site issuing them saying that converter boxes should cost between $40 and $70. But the transition team working towards the inauguration of the new president on January 20th argues there's now a waiting list for the coupons. Up to a million people have applied for their coupons but not yet received them, it claims, and not enough help has been given to the elderly, the poor and rural communities to prepare for the switchover. "All of the above leads to the conclusion that the Feb. 17 cutoff of analogue signals should be reconsidered and extended," said Podesta. Figures from research company Nielsen suggest that as of last month almost 8m households, or nearly 7% of US homes with TV, have done nothing about getting ready for the February 17 analogue switch-off. Those households will be left without any TV signal after broadcasting goes all-digital. However, leading US consumer electronics industry figures are opposing any delay, saying that the February 17 date is now familiar to the public. Gary Shapiro, President and CEO of the Consumer Electronics Association. says that "If the goal is to avoid consumer confusion, keeping the February 17 transition date that is engrained in consumer minds is the best solution. "Above all, CEA is committed to working closely with the new Administration to support all of their efforts to ensure the smoothest possible DTV transition for U.S. consumers."